Marine investigations and security consultancy Gray Page has launched an all-plastic, modular barrier system, developed to prevent over-the-side access to vessels of all sizes, either by pirates, stowaways or other illegal boarders. As well as protecting ships and boats, the system, branded DFENCE, could also be used to protect offshore platforms and rigs from intrusion, Gray Page claims. Managing director James Wilkes says that the company decided to develop DFENCE, its first physical offering to date, “in the absence of a product on the market that did everything we wanted it to do”. How to best secure vessel perimeter rails has vexed many a security expert. A number of operators have plumped for deterrence instead, utilising fire hoses and whistles – or even ultrasonic weaponry – to deter pirates from attempting to draw alongside and storm the vessel. However, ensuring that these criminals are physically unable to do so is another matter; it only takes one dedicated, armed individual to access the ship for the master and crew to potentially lose control of the situation. One proposed solution has been to defend the perimeter rails with razor wire – though, as Wilkes tells Ship & Boat International, this material comes with a series of drawbacks. Notwithstanding the fact that a combination of salt, sun and seawater can cause significant material degradation within months, razor wire is a “nasty and very dangerous material for crew to handle,” he says. Consequently, this has led to vessel operators removing their razor wire perimeter fences when calling at port, only to have to reinstall them before returning to waters blighted by pirate activity. Often, this involves rebuilding the fence from scratch. Wilkes points out that, although razor wire may be relatively cheap, repeatedly building these fences and tearing them down eventually takes its toll in material and labour costs – as well as endangering crew members every time the fence comes up and goes down. It is common for crew to toss older or damaged razor wire fence sections into the sea. Interestingly, it’s disputable whether razor wire fencing even deters experienced pirates. “Some pirates have pulled alongside their target vessels and effectively stripped the razor wire off the rail using a grappling hook attached by rope to a bucket, which is then sunk as a drogue,” says Wilkes. The next problem was that while Gray Page knew to advise its clients on the pitfalls of razor wire, the majority of plastic barrier solutions on the market were perceived to have drawbacks too. For instance, Wilkes says, certain plastic products incorporated metal screws and fixtures that would ultimately prove unsuitable for a marine environment and eventually require replacement. As a result, Gray Page developed DFENCE as an all-plastic and modular solution, containing “nothing to rot or rust”, Wilkes says. Just as importantly, the material poses no risk to crew members and is relatively easy to install and remove. “For 12m of perimeter rail, the system can be installed in 15 minutes or so and taken down in less than five minutes,” he explains. The material has also been treated with a UV15 stabiliser, designed to ensure longevity in harsh marine environments for up to 15 years. Each DFENCE section incorporates three outboard modules – a back plate, knuckle and blade – each of which features a different profile and weighs 5-6kg in total. When assembled, this creates a protective barrier around the rail, and extends over the rail by 750mm, which makes it near impossible for intruders to breach this vessel area. The jagged shape created by the barrier makes it extremely difficult to access the rail section from below; the design effectively deflects grappling hooks and destabilises ladders and poles. “The top of a ladder, placed against the barrier, will deflect and twist,” says Wilkes. 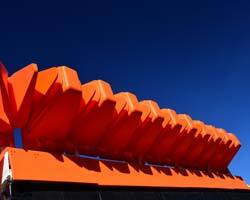 “You won’t be able to get up to 2m on a 3.5m ladder without falling.” And, produced in distinctive safety orange, the system is intended to highlight the vessel’s relatively impenetrable nature to pirates, even from a distance of a few miles.